Welcome to my new blog! 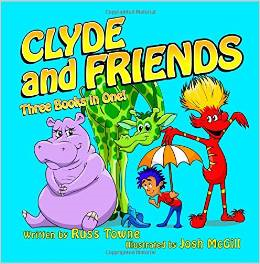 Clyde and Friends is intended to showcase my creative adventures and misadventures. May you always feel welcome and at home here. This blog is still under construction. Please pardon my dust. Your patience is appreciated. I hope to see all of you at my latest blog, Clyde and Friends. The reason for the move is that after feedback from a few folks I’ve decided that my second book to be published should be a sequel of my first book, “Clyde and I”. 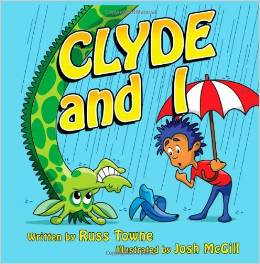 The second book will be titled “Clyde and I Help a Hippo to Fly”. Since my first two children’s books will involve “Clyde and I”, I thought it would be more appropriate to use the blog with “Clyde” in the name for my creative posts. 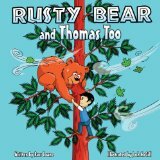 I still plan to self-publish the story “Rusty Bear and Thomas, Too” most likely as my third children’s book. Each book is fairly expensive to publish, so I’ve got to be extra careful which stories I publish and in which order. The poor hippo in “Clyde and I Help a Hippo to Fly” has undergone yet another name change. I really liked “Hattie” as her name, but another author used it before me, so I’ve attempted to come up with a name that is very unlikely that anyone has already used in a children’s book or plush toy. And the winner is…Hippita. Hippita Hippo. The editing for the book co-starring Hippita has been completed. I will soon send it to my layout specialist for story-boarding. 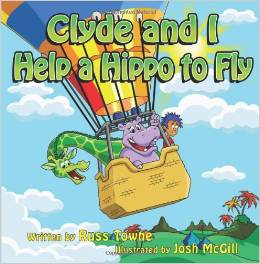 Then in 1-3 weeks, I plan to request the same great illustrator Josh McGill to begin the initial illustrations for “Clyde and I Help a Hippo to Fly”. As for the Kickstarter campaign, we have received pledges for 60% of the target budget. 28 people have made pledges toward this project and I am grateful to every single one of them. Kickstarter is an all-or-nothing venture. If we don’t get to 100% of the funding goal in the next 12 days, then all bets are off and I don’t receive any of the money, and the people who made the pledges will pay nothing and won’t get any of the rewards or incentives I’ve developed for them. So, if you haven’t yet made a pledge and would like to consider doing so, there is still time, but the deadline is getting closer with every hour that passes by, so please check out my Kickstarter campaign at Kickstarter.com search “Russ Towne” or “Clyde and I”. I intend for this to be my only fund-raising attempt toward my goal of kick-starting a self-funding/self-sustaining series of children’s books and other creative endeavors, so please know that after this Kickstarter campaign is over I’m very unlikely to do another one or anything similar. Kickstarter is a great idea to help creative people get started and to offer people from around the world to be able to support the arts in whatever amount works for them, and to give people an opportunity to be a part of helping these books become alive in the hands of hundreds of young children and their loved ones. But I’m finding it very distasteful to ask people for support and I’ll be quite happy when the Kisckstarter campaign ends–regardless of the outcome. Also, if you’d be so kind, please spread the word about my project so others may become aware of it, and of my books. 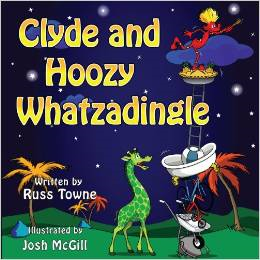 This entry was posted in Uncategorized and tagged "Clyde and I", children's books, children's stories, giraffe, hippo. Bookmark the permalink.